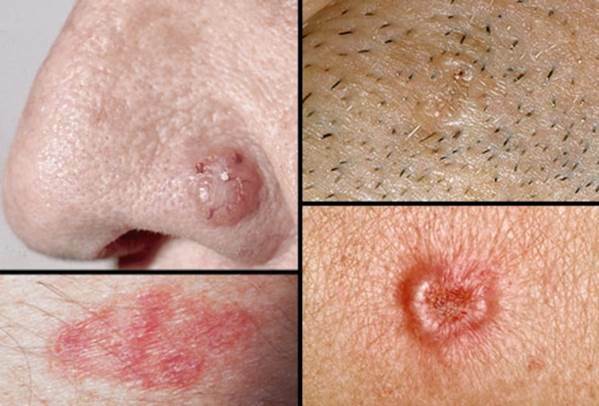 Basal cell carcinomas make up about 2/3 of all skin cancers in South Africa and according to the National Cancer Registry in 2013, there were almost 16 000 new cases of basal cell carcinomas reported. These malignancies, sometimes called “rodent ulcers”, thankfully rarely metastasize or kill, but they can still cause significant morbidity through local destruction and disfigurement. They are raised, translucent, pearly nodules that may crust, ulcerate and sometimes bleed. They are found most often on the face and other sun-exposed areas but can appear anywhere. It can involve nerves and even invade into bone. Although considered a “better” diagnosis to receive, it still needs to be treated with respect and dealt with in the earliest possible stages. Basal cell carcinomas can be cured in almost every case, although treatment can be more complicated if the cancer has been neglected for a long time, or if it occurs in an awkward place, such as close to the eye or on the nose or ear. At Atlantic Dermatology and Laser, we will explain the importance of the subtype of basal cell carcinoma with its implications on treatment choice. We will carefully weigh up the best and safest course of treatment with the optimal possible cosmetic outcome. Together with you, all variables will be considered and a treatment plan formulated.